1-2-3, 1-2-3, 1-2-3... Is it somebody learning to waltz? A rock muso confounded by the verses to ‘Lucy in the Sky with Diamonds’? Perhaps a roadie that’s one smarter? 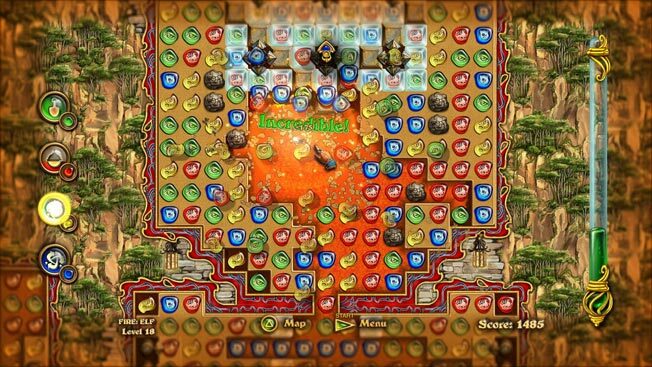 While colour matching is the key element (heh) here, the game itself is an intriguing melange of your Columns/ Bejeweled/Zoo Keeper kinda stuff cross-pollinated with smatterings of Boulder Dash, Mr Driller, Gauntlet and even Shanghai – plus bountiful dollops of basically every medieval fantasy thing ever. You’re tasked with taking on 64 levels using Move or DualShock (we recommend the latter). You must harness the elements – earth, win... erm, air, fire and water - by clearing the way for a lava flow through various sprawling levels to their ending altars. This is accomplished by matching similarly coloured doobries, which knocks out impediments to flowiness. Well, sometimes. For as you progress, you encounter blocks that require a couple of hits, others ensconced in ice needing alternative assault tactics and some that are seemingly immovable – until you get flow to the game’s equivalents of holy hand grenades which do the seek and destroy thing on them. There’s more to this than basic matchingnessism. The bigger the chain of doobries you manage the better your score. You also have four helper power-ups, acuity with which makes the difference between conquering a level and repeating it endlessly. Level timers start nice but soon get nasty. Hell, there’s even a kind of ‘Pimp my Castle’ thang in-between levels where you use you accrued points to purchase walls, roads, towers and stuff. MMMmmm... battlementy. Seriously challenging and alarmingly addictive, if you don’t check this out then we shall taunt you a second time.